With this product, you earn 145 loyalty points. White Ginger Contouring Oil offers a global solution for women looking for lighter-feeling legs. Combined with a specific massage technique, it offers 4 highly targeted actions : 1. Anti-fatigue action White Ginger extract and Ginkgo Biloba oil extract. 2. Remodeling action Gelidium cartilagineum extract and Cedrol. 3. Toning action Essential oils of Rosemary and Litsea cubeba, combined with White Ginger extract. 4. Enhancing action Shea, Macadamia and Andiroba oils . Immediately, sensations of discomfort are soothed. Skin is softer, smoother,more toned. Day after day, legs feel lighter. The silhouette is reshaped. 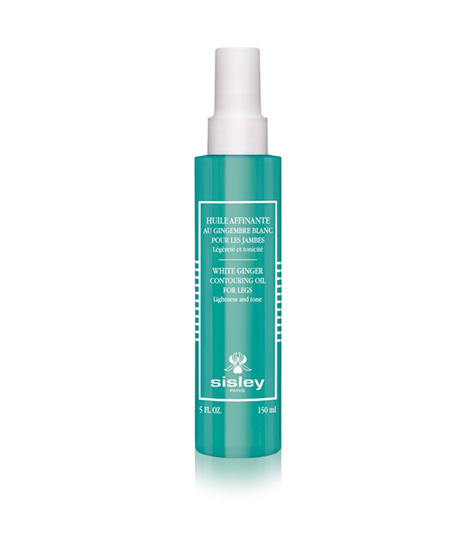 A beauty oil with a silky texture that is easy to apply and lends itself to a long massage, ideal for toning the legs. Leaves a satiny veil on the skin. Its aromatic essences and fresh fragrance promote a sensation of complete well-being. Does not stain. Allows you to dress quickly after application Immediately, sensations of discomfort are soothed. Skin is softer, smoother,more toned. Day after day, legs feel lighter. The silhouette is reshaped.